We were lucky enough to have a personal visit from Raymond Blanc who signed in our bookshop in October 2016. Set in the rolling Oxfordshire hills, Le Manoir aux Quat’Saisons is a bastion of haute cuisine and a beacon of l’art de vivre. It is also the only country house hotel in Britain to have held two Michelin stars for more than three decades, presided over by the great chef Raymond Blanc. This book is Raymond’s personal tour of Le Manoir through the four seasons; the ultimate host, he lovingly reveals the stories behind rooms that are luxuriously appointed and gardens that are ravishingly beautiful. 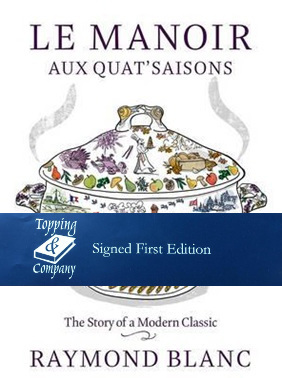 With spectacular photography of the luxurious rooms and the ravishing gardens, as well as beautiful and witty illustrations, the fairy tale of Le Manoir aux Quat’Saisons has been brought charmingly to life.